Figures up to the 29 August show that 366.8 mm of rain fell across the UK. It is not expected that rainfall this summer will exceed the 384.4 mm of rain seen in the summer of 1912, which is the wettest. These latest figures follow a record wet April, and an April to June period that was also the wettest recorded in the UK. August 2012 looks set to be the driest and sunniest of the three summer months across the UK with 105.5 mm of rain to the 29 August and 140 hours of sunshine up to 28 August. The mean temperature for August was 15.7 °C, in a month that also saw the hottest day of the year so far, reaching 32.4 °C at Cavendish, Suffolk on the 18th. 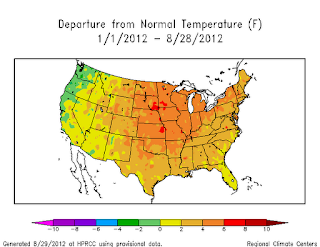 Summer 2012 is also likely to be one of the dullest summers on record with just 399 hours of sunshine up to 28 August. This makes it the dullest summer since 1980 when the UK saw only 396 hours of sunshine. To complete the disappointing picture, it has also been a relatively cool summer with a mean temperature of 14.0 °C, some 0.4 °C below the long term average. 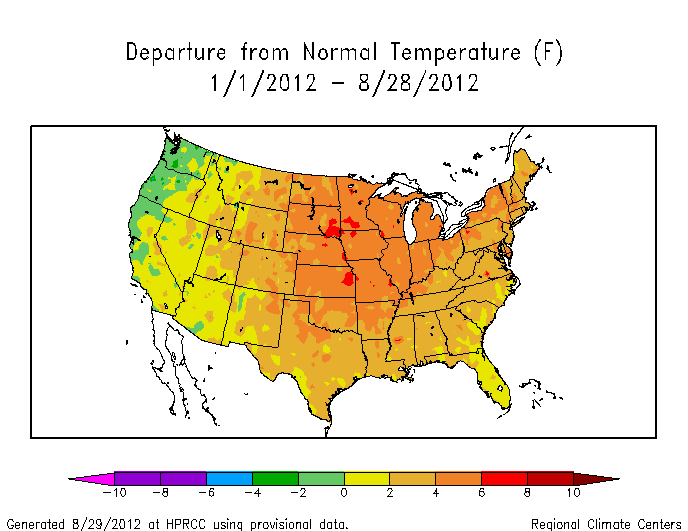 Despite this it was a little warmer than the summer of 2011 which saw a mean temperature of only 13.7 °C. Unsettled weather has never been far from the UK during the past three months. Movements in the track of the jet stream, a narrow band of fast flowing westerly winds high in the atmosphere, have contributed to the weather we have seen. This summer has seen periods of heavy and prolonged rain, as well as short but exceptionally heavy thundery downpours and only brief warm sunny spells. Looking at the individual countries of the UK, it is set to be the second wettest summer on record in England, third wettest in Wales, ninth in Northern Ireland, and the seventh wettest in Scotland. For sunshine it is expected to be the second dullest summer in England and Wales, 12th in Northern Ireland and 16th dullest in Scotland. The record warm year of 2012 continued through the 37th consecutive week of above-average temperatures in the U.S., according to preliminary analysis from the National Climatic Data Center for August 19-25. 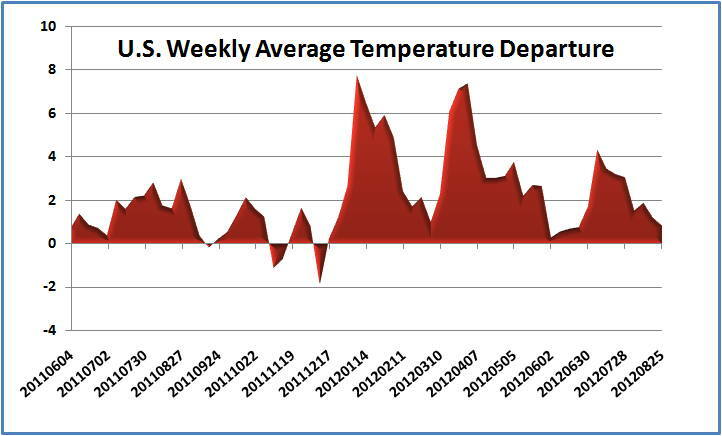 The national average of 0.8° above normal was down slightly from 1.2° the previous week. 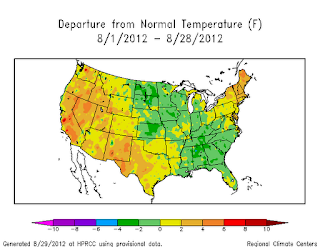 The month-to-date average was 1.3° warmer than normal with one week left in August. 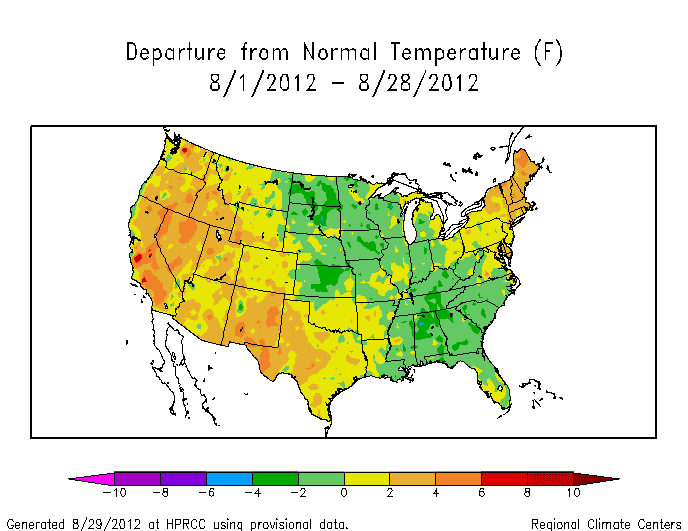 Once again, only 3 of the 9 regions were cooler than average (East North-Central, Central, and Southeast). Given the remarkable week-to-week consistency of the warm temperatures, it's not surprising that nearly the entire country is averaging above normal for the year to date. Only the Pacific Northwest and parts of northern California have been cooler than average in the interval from January 1 through today.